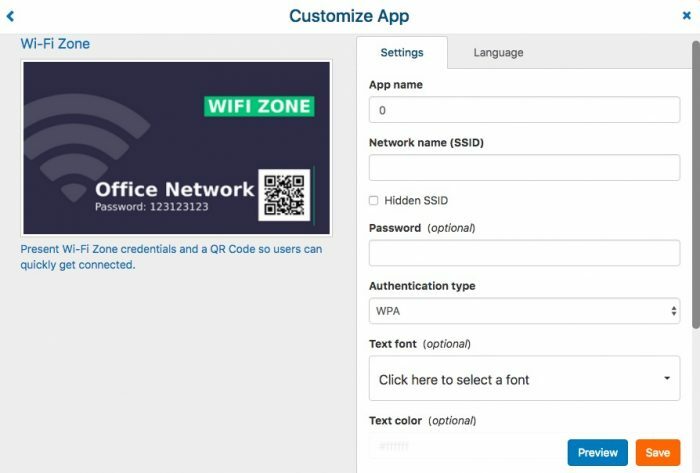 If you offer complimentary Wi-Fi to your visitors and want to free your staff from needing to assist the typing process, you can display your Wi-Fi credentials together with a QR Code on screen. The OnSign TV Wi-Fi App does it for you. Go to your App Gallery in your OnSign TV account. On the pop-up window, select "Text and Scrollers" from the sidebar menu. Last on the list, you will find the Wi-Fi Zone App. Fill out your details and customize the design to your needs. App name: Name the app something you can easily recall when creating campaigns. Network name: Which network should your visitors connect to? You can hide the network name by checking the box "Hidden SSID" if you don't want to disclose it, but it is necessary to create the QR code. Password: The time consuming questions to your staff about the exact spelling of the password are a thing of the past if you showcase it to your visitors on screen. If you rather want to control who get's access to your Wi-Fi, it is optional. Authentication type: Check on your Wi-Fi device, which system it uses. Customize fonts, colors and backgrounds, as well as the language for the indicating labels to your needs. "Preview" and if you like the result confirm with "Save". The App is now part of your App folder in your Content Library and can be used with any campaign.